Editor/Author Crow, Ben and Lodha, Suresh K.
Drawing on research from around the world, this atlas gives shape and meaning to statistics, making it an indispensable resource for understanding global inequalities and an inspiration for social and political action. 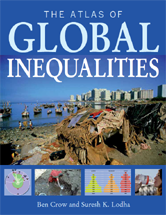 Inequality underlies many of the challenges facing the world today, and The Atlas of Global Inequalities considers the issue in all its dimensions. Income Income inequality both between and within countries has risen dramatically during the process of industrialization. Household Wealth Household wealth is unevenly distributed across the world. A huge proportion is concentrated in the hands of a very few. Consumption Poor households have to spend most of their income on food, with little left for other purposes. Work & Unemployment Differences in livelihoods, remuneration, unemployment, and underemployment create considerable inequalities. Labor Migration Labor migration can help address global inequalities. International Trade Globally determined commodity prices and high tariffs on imports from poorer nations create barriers to trade equality. Budget Priorities The proportion of GDP that governments spend on the military, healthcare, education, and social security provides one measure of their social priorities. Government Action In response to popular pressure, governments may attempt to reduce inequality through minimum wage laws, progressive taxation, and land reforms. Freedom & Democracy While freedoms and democracy are hard to quantify, even rough measures indicate significant inequalities within and between nations. Incarceration & Execution Rates of imprisonment vary widely around the world, and the use of execution is rare in industrialized countries. Gender Bias against women is reflected in their unequal political and economic participation and influence, their hours in unpaid work, and in the preference for sons over daughters. Age Age distinctions can create inequalities by excluding age groups and undervaluing their work. Population structures provide impetus for looking beyond national boundaries. Class Class divisions separate the rich and powerful from those who have little opportunity to gain wealth and influence. Race & Ethnicity Some minority ethnic and religious groups suffer systematic discrimination. Inequalities associated with ethnicity are frequently intertwined with those of gender and poverty. Child Labor Millions of children are employed in paid or household work. Raising wages and reducing poverty is the most effective way of reducing child labor. Poverty Poverty remains widespread, but recent studies suggest new avenues for action. Hunger Hunger, is one of the most devastating dimensions of inequality. Children are particularly at risk from its effects. Household Water Poor people and those living in rural areas are least likely to have easy access to safe drinking water. Energy Energy is a prerequisite for economic opportunities and human development that remains inaccessible to many due to poverty, rural location, or lack of infrastructure. Household Fuel Most people in developing countries have access only to biomass and solid fuels for household use. These fuels pose serious health hazards. Mobility The opportunity to travel easily and safely even for short distances is a key indicator of both economic and gender inequality. Digital Divide The digital divide between industrialized and non-industrialized countries constrains the advance of healthcare, education, social freedoms, and livelihoods. Life Expectancy Societies with higher GDP tend to have higher life expectancy. Societies with greater equality achieve longer life spans than more unequal societies. Maternal Mortality The half a million women who die each year from complications related to pregnancy are mainly from the poorest people in the least developed countries. Child Mortality Children in developing countries become sick and often die of preventable or treatable diseases. Access to Healthcare Access to healthcare is worst in low-income countries, in rural areas and for the poor. The rich benefit most from government health expenditure. Infectious Diseases Malaria, HIV/AIDS, and tuberculosis have a devastating effect on the poorest and most vulnerable people in developing countries. Literacy Poverty, poor quality education, and lack of educational opportunity for girls all influence national literacy levels. Barriers to Education Poverty, gender, disability, language, location, and ethnicity constitute major barriers to education. Early Childhood Care & Education Children who are denied access to early childhood care and pre-school education suffer a range of health and educational disadvantages. Climate Change Industrialized countries have historically been the largest carbon emitters, but developing nations and the poor bear the brunt of the resultant climate disasters. Deforestation Rapid deforestation is having a negative environmental impact and threatening the livelihoods of a quarter of the world's population. Air Pollution & Health Air pollution, both indoors and outdoors, is a significant cause of death and disabling disease. Water & Health A tenth of all disease could be alleviated by improvements in household water, sanitation, and water-resource management. The poor are most likely to lack clean water and sanitation services.